Impiria Residensi is a residential development nestled within an integrated commercial development comprising two levels of retails shops and one boutique hotel. 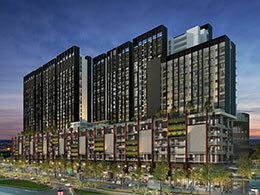 Strategically located within the matured and vibrant township of Bandar Bukit Tinggi, Klang, Impiria Residensi features well-planned architecture that offers a range of remarkable facilities for security, convenience, entertainment, lifestyle and easy accessibility. Consists of 403 units of service apartments with three types of design: 855sqft 1,065sqft and 1,316sqft.